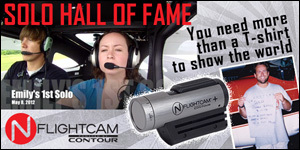 NFlightcam has launched an interesting campaign called the Solo Hall of Fame. It is their goal to help students share the accomplishment of their solo flight by documenting the experience with an in-cokpit video of the achievement. The great thing about this program is they will send you a free Nflightcam+ and suction cup mount for you to use on the day of your solo. Once you come down from the cloud none that is soloing, you simply send them the video camera back and a week later they send you a link to a professional edited video of your flight for you to share with the world. I absolutely love this program and applaud them for giving students this opportunity. With a shrinking pilot population we all have a bigger burden to inspire others to fly and here is a company that at no cost to pilots is giving students a great means to inspire others and to celebrate their own achievement. That being said would you have wanted a camera in the airplane for your first flight? I seem to remember bouncing with excitement and maybe even talking words of encouragement & celebration to myself on downwind leg of my first solo. Maybe those are private moments that should live on in my own memory only. But, I think instead I would have enjoyed having that video for my own personal collection and to share with others. Check out the video below of Emily Carter on her first solo flight. She is the wife of NFlightcam's founder Patrick Carter and author behind The Pilot's Wife blog. Any pilot who has soloed will see a bit of themselves in this video. At the beginning there is that slight apprehension about stepping of the ledge and agreeing to let your instructor out of the plane. We all have the confidence needed, but it takes a moment for it to manifest itself when we were asked if we wished to solo, or atleast that is how I recall it from my experience. My favorite part of this video is the smirk at the end of the video (see the 3:32 mark in the film) which captures in visual format the sheer joy of flying and the thrill of an amazing achievement. I think we all have the photo of us standing next to the plane or holding a slice of t-shirt post solo, but I would trade any of those for video or a picture of my version of that smirk when I successfully completed my first solo flight. Do you know of a student that is close to soloing? If so make them aware of the Solo Hall of Fame program. NFlightcam is a small camera that records HD video, plus audio from the intercom; it is unobtrusive and self-contained, weighing a mere 5 ounces and has limitless mounting options for both inside and outside the aircraft. The Solo Cam kit includes an easy-to-use suction cup mount that works on any smooth flat surface inside the cockpit. This is a seriously awesome promotion. I sure wish it had been around for my first solo four years ago! You're right - not only should we applaud them, we should make sure AOPA and EAA get the word out about this. I think this is a great idea! Anything to promote learning to fly should be embraced given the lack of student starts and the declining number of pilots.